Chinese oil industry officials offered two explanations for the early cessation of commercial operations and the relocation of HYSY-981 to Hainan Island. 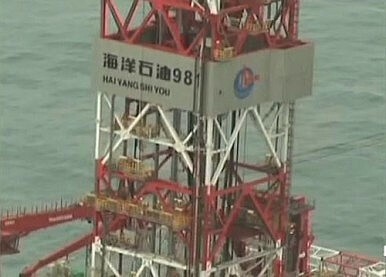 According to the statement issued by the China National Petroleum Corporation, “the petroleum drilling and exploration operation of Zhongjiannan Project was smoothly completed on schedule on July 15th with the oil & gas shows found.” During the period the HYSY-981 was in operation, two exploratory wells were drilled. Prior to the drilling operations carried out by HYSY-981, the U.S. Energy Information Administration issued a report in 2013 that concluded that the area around the Paracel islands was unlikely to have significant potential for conventional hydrocarbons. In May, Beijing-based diplomats reported that officials from the China National Offshore Oil Company privately confided that when initially requested to deploy the HYSY-981 drilling platform they declined, arguing that the exploration area in question was not a high priority as it was unlikely to contain significant hydrocarbon reserves. Maritime security analysts with access to satellite imagery reported that in late May flaring from the HYSY-981 was observable, indicating that the drilling platform had discovered some hydrocarbons. These analysts also noted that about only ten percent of the hydrocarbon reserves would be recoverable for commercial use. As a result of exploration activities Chinese analysts offered upbeat assessments of hydrocarbon reserves in the area west of the Paracels. Kang Lin, a researcher at China’s NISCSS, reported that a “good amount” of energy reserves with “huge commercial value” had been discovered. The initial announcement on the deployment of the drilling platform by Hainan Maritime Safety Administration stated, “South China Sea drilling work by M/V ‘Hai Yang Shi You 091’… [will be conducted from] from 02 May to 15 Aug…” It was widely assumed that the August 15 cut off date was related to the typhoon season. It also meant that China was avoiding an open-ended commitment. In the second week of July meteorologists identified a brewing tropical storm heading for the Philippines. The storm quickly reached Category Three level and was named Typhoon Rammasun. The typhoon hit Luzon Island on July 15-16 before entering the South China Sea on a course headed for Hainan Island, southern China and northern Vietnam. What most commentators overlooked was that Typhoon Rammasun was a threat to the armada of over one hundred Chinese ships, vessels and boats providing protection to HYSY-981. Chinese officials obviously took the prudent decision to stand down operations. The HYSY-981 was towed back to the vicinity of Hainan Island and the opposing maritime forces dispersed to seek the safety of nearby anchorages and ports. Other analysts pointed to pressure from the United States. They cited China-U.S. exchanges at the Strategic and Economic Dialogue held in Beijing from July 9-10, a Senate resolution (S. RES.412) adopted on July 10 calling on China to withdraw the oil drilling rig and accompanying ships, a call for a “freeze” in China’s provocative actions by Deputy Assistant Secretary of State Michael Fuchs at the fourth CSIS conference on the South China Sea on July 11, and a telephone conversation between President Barack Obama and Xi Jinping (July 14) in which Obama called for the constructive management of differences. New information has emerged that a fourth factor may explain the early cessation of exploration activities by HYSY-981. Beijing withdrew its drilling platform early in order to prevent relations with Hanoi from worsening to such an extent that Vietnam not only took legal action against China but also aligned itself more closely with the United States. Immediately after the oil rig crisis broke out, Vietnam’s leaders adopted a conciliatory diplomatic posture. Vietnam immediately requested the activation of the hot line between senior leaders. When this was declined, Vietnam offered to send a special envoy and then pressed for a visit by its party secretary general. According to Minister of National Defense General Phung Quang Thanh, in answer to a question at the Shangri-La Dialogue, Vietnam made thirty or more efforts to initiate discussions with China but, as of May 31, Beijing had yet to reply to any of them. The Vietnam Communist Party’s Central Committee convened its long scheduled ninth plenary session from May 8-14. A heated debate erupted about how Vietnam should respond to China’s challenge to Vietnamese sovereignty. The final communiqué issued after the plenum gave the impression that “it was business as usual” and gave no hint of internal party disagreements over South China Sea policy. While the Central Committee was in session peaceful anti-China protests took place in Hanoi, Ho Chi Minh City and other urban areas on May 11. Anti-China protests by Vietnamese workers in Binh Duong, Dong Nai and Ha Tinh provinces turned violent on May 13-14. Relations with China plummeted after workers set fire to Chinese and other foreign-owned factories. China promptly organized ships to evacuate its nationals. Nguyen Manh Hung, a Vietnam specialist, noted that a groundswell of opinion in Vietnam had begun to demand an escape from China’s orbit or “thoát Trung” in Vietnamese. In other words, public opinion was turning in favor of alignment with the United States. On May 21, Foreign Minister Pham Binh Minh took the unprecedented step of telephoning Secretary of State John Kerry to discuss tensions in the South China Sea. Minh also offered to coordinate with the U.S. in implementing concrete measures to further develop the comprehensive partnership between the two countries. Secretary Kerry invited Minh to Washington for full consultations. Vietnam deferred Minh’s trip to Washington pending the outcome of the visit by China’s State Councillor Yang Jiechi. Vietnamese officials told this author that Minh’s immediate dispatch to the United States was “too sensitive” at this time. On June 18 Councillor Yang arrived in Hanoi to attend the long-scheduled annual meeting of the Vietnam-China Joint Steering Committee for Bilateral Cooperation. This committee has oversight of the entire range of Sino-Vietnamese bilateral relations. The discussions between Yang and his Vietnamese counterpart, Deputy Prime Minister and Minister of Foreign Affairs Pham Binh Minh, were not strictly convened to discuss South China Sea issues; but it is clear the oil rig crisis dominated talks. In private remarks Yang strongly advised Vietnam not to take legal action against China in the interest of repairing bilateral relations. Yang also held meetings with Prime Minister Nguyen Tan Dung and party Secretary General Nguyen Phu Trong. The latter meeting was especially significant because it led to an informal understanding to find a mutually acceptable way out of the current impasse. In order to clear the way for bilateral discussions both sides agreed to conduct follow up discussions by party officials responsible for external affairs. While Chinese and Vietnamese party foreign affairs specialists began sounding each other out, Vietnamese party leaders agreed to convene a meeting of the Central Committee specifically to focus on the South China Sea dispute and the proposal to initiate legal action against China. Given the ground swell of anti-China opinion in the party and society at large “to break out of China’s orbit,” it appeared likely that the Central Committee would not only approve legal action against China but also approve steps to align more closely with the United States. Foreign Minister Minh’s trip was approved and he is scheduled to visit Washington in September. It was in this context that China decided to announce the early withdrawal of HYSY-981 from contested waters. According to retired General Nguyen Trong Vinh (xuandienhannom blog, July 16), China deliberately withdrew the oilrig to influence the outcome of the forthcoming Vietnamese party plenum. The coincidence of Typhoon Rammasun provided the pretext. If Chinese officials were concerned about the safety of HYSY-981 they should have left it in place rather than tow it towards Hainan Island where Typhoon Rammasun was headed. China’s actions in withdrawing its oil drilling platform and protective armada should strengthen the hands of the “pro-China” or accommodationist faction with the Vietnam Communist Party. Vietnamese party conservatives generally have shown themselves to be risk adverse and cautious. China’s gambit is a gift to those who believe relations with Vietnam’s neighbour to the north can be managed best through party-to-party ties. Other members of the party view national interests as more important than socialist ideology. They view Vietnam’s hierarchy of foreign relationships that puts China on the top as a “comprehensive strategic cooperative partner” as in tatters. They note that the United States, a mere “comprehensive partner” has done more to support Vietnam’s sovereignty than Russia, listed second in the hierarchy as a comprehensive strategic partner. Vietnamese leaders now face some tough decisions. If they drop their legal case against China and hold back on stepping up defence and security cooperation with the United States, what assurance will they have that Chinese oil exploration ships and platforms will not return in the future? If Vietnam decides to go ahead with its legal case, what sanctions can they expect China to impose in return? China’s actions in defusing tensions and turning from maritime confrontation to diplomacy should take the sting out of U.S. efforts to push strongly for adherence to the rule of international law at the forthcoming ministerial meeting of the ASEAN Regional Forum in August. It is also likely that China’s shift in tack will be welcomed among ASEAN members who are both anxious about China’s recent aggressive assertiveness and loathe to confront China directly.